After watching some NFL playoff games this past weekend I thought about SUPER BOWL and the foods I love to eat while watching the game. Garlic bread came to mind! 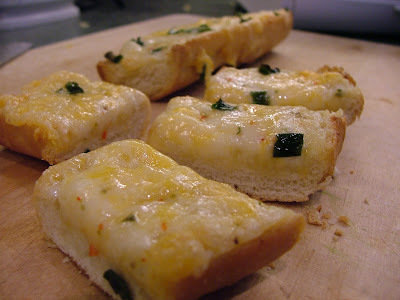 I had some Jalapeño Havarti cheese in the fridge and thought it would be REALLY good on garlic bread. It was Awe...(no not again!). I mean Absolutely Delicious!!! I went a little "AWESOME" crazy in the video (I counted 5)...got excited about this garlic bread! It happens! The recipe below is for making it in a toaster oven. If using an oven, double the recipe because this garlic bread will disappear fast! In a small bowl whisk together mayo, butter, Parmesan cheese and garlic powder. Spread equal amounts of the mayo garlic mixture evenly over baguette slices. Top each slice with equal amounts of marble Cheddar cheese and Jalapeño Havarti. Sprinkle green onions on top. Place on a baking sheet and bake in a 425º F toaster oven (or oven) until cheese is golden and bubbly, about 10 minutes. Cut into individual slices and serve. Ah delicious! Cheese, bread, jalapeños...yep that is going to be a hit!